Edmund Halley (1656–1742) is best known for having calculated the orbit of a comet that passes by Earth every 76 years. The comet known as Halley's made its first appearance under that name in 1682. During the next decade, Halley turned his attention away from the celestial in favor of the subterranean. He claimed that the Earth was hollow and populated by humans and beasts. Halley's Hollow Earth idea was developed further during the eighteenth and nineteenth centuries, and sometimes backed by sound scientific reasoning. None of the claims of Hollow Earth proponents have been substantiated, however. Those still holding to the belief in the twenty-first century are part of a long history of people who believe human life exists beneath the surface of the Earth. Halley's theory was based on the fact that the earth's magnetic field varies over time. Halley suggested that there were several magnetic fields, one of which emanated from a sphere within the earth. Halley eventually developed the idea that there were four concentric hollow spheres within the earth. He believed the inner earth was populated with life and had a luminous atmosphere. The aurora borealis, he concluded, was actually an emanation of radiant gases from within the earth that escaped through thin layers of crust at the poles. During the eighteenth century, Halley's Hollow Earth theory was adapted by two other famed mathematicians, Leonhard Euler (1707–1783), a Swiss, and John Leslie (1766– 1832), a Scotsman. Euler abandoned Halley's concentric spheres idea. He postulated that a glowing core some six hundred miles wide warmed and illuminated the inner earth, where an advanced population thrived. Leslie, on the other hand, believed there were two concentric spheres within the earth each with their own sun, which he named Pluto and Proserpine after the Greek god of the under-world and his mate. Perhaps the most enthusiastic proponent of the Hollow Earth idea was John Cleves Symmes, who was born in 1780 in New Jersey. He was named after an uncle who fought in the American Revolutionary War. Symmes fought in the War of 1812, after which he moved to St. Louis, Missouri, and established a trading post. He immersed himself in reading books in the natural sciences. By 1818 he was publicizing his version of the Hollow Earth, which had concentric spheres and received light and warmth from the sun through large holes in the planet open at each of the poles. Symmes proved relentless in publicizing his views: he was a prolific lecturer and writer of letters and articles; wrote fictional accounts of the Hollow Earth, including Symzonia: Voyage of Discovery (1820), which he published under the pseudonym Adam Seaborn; and advocated expeditions to the poles. His Hollow Earth illuminated by openings at the poles became the most popularly known version, and one that would be tested as humans began struggling to reach the poles. Symmes was able to impress two influential men who would take his cause further. James McBride, a wealthy Ohio man, wrote articles supporting the concentric spheres version of the Hollow Earth. He lobbied a U.S. senator from Kentucky to support a bill funding a proposed expedition to explore trade routes in the southern hemisphere (where McBride hoped the expedition would continue on to the open pole). The senator he had lobbied, Richard M. Johnson (1790–1850), later became vice president of the United States under Martin Van Buren (1782–1862). In 1828, President John Quincy Adams (1767–1848) indicated that he would approve funding for the expedition. However, when Adams left office in 1829, his successor, Andrew Jackson (1767–1845), stifled a bill funding the proposed expedition. Symmes died in 1829, but his cause was continued by Jeremiah Reynolds, an Ohio newspaper editor. After the failure to get government funding for the expedition in 1829, Reynolds joined a crew sailing to the south seas to hunts seals, but seven years later in 1836, he helped renew efforts for funding of a Southern Hemisphere expedition. Reynolds spoke before Congress, emphasizing the national glory that would accompany scientific discoveries and expanded foreign relations, but he became so impatient with the methodical planning and a series of delays that he was fired from the crew. earth. The world's seventh continent, Antarctica, was officially recognized for the first time. The open poles theory promoted by Symmes had been effectively undermined, but the belief in the Hollow Earth would only grow more popular. In 1846, the remains of a woolly mammoth, a creature long extinct, were discovered perfectly preserved in ice in Siberia. So suddenly had it been frozen, that the mammoth had not yet digested pine cones it had recently eaten. It was theorized that the animal had been caught by a climate change, but many questioned that such a change could have happened so quickly and thoroughly. Some people believed the animal had wandered out from the Hollow Earth through a hole at the North Pole. As late as 1913, even after the North Pole had been reached, Marshall Gardner published A Journey to the Earth's Interior, or Have the Poles Really Been Discovered? which claimed that many creatures thought to be extinct were still thriving within the earth. Gardner theorized that the interior earth was warmed by materials still spinning since earth's creation. Based on the law of centrifugal force, Gardner argued that earth was originally a spinning mass of matter. An outer layer of matter had hardened and continued to revolve around a central axis, while an inner layer also hardened and was warmed by heat continually generated by the earth's spinning. That same year, William Reed published The Phantom of the Poles (1906), in which he promoted the idea that a ship can pass from outer Earth to inner Earth. The effect of gravity pulls a ship against the interior in the same manner as it works on the exterior. He claimed that some sailors had already passed into inner Earth without knowing it. Gravity had pulled them to the interior side, where a 600 mile-long sun continued to keep them warm, as the outer sun had done. 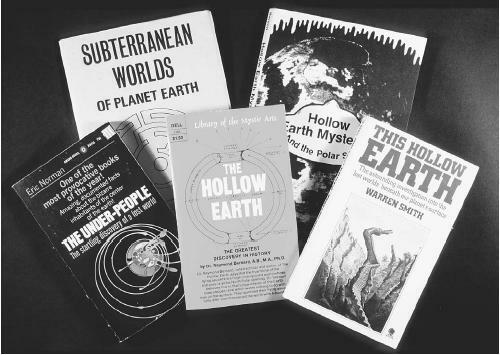 In between the woolly mammoth find and those publications of 1913, fascination in the Hollow Earth was exhibited by scientists and science fiction writers. Jules Verne (1828– 1905) published Journey to the Center of the Earth (1864), in which characters enter the Earth's interior through the chimney of an inactive volcano in Iceland. In 1873, The Coming Race, a novel by the occultist Edward Bulwer-Lytton (1831–1891), was set in the Earth's interior, where an advanced civilization of giants thrived. In this story, the giants had built a paradise and discovered a form of energy so powerful that they outlawed its use as a potential weapon. The paradise is threatened, nevertheless; not by weapons, but by a lack of conflict that has resulted in general boredom. One of the more interesting variations on the Hollow Earth theory during the late nineteenth century was expounded by Cyrus Read Teed (1830–1908). In The Cellular Cosmogony, or The Earth, A Concave Sphere, Teed claimed a civilization inhabited the concave inner surface of Earth. Dense atmosphere prevents viewing across the surface. The Moon, according to Teed, reflects the larger, uninhabitable surface of Earth. Teed made a religion of his discoveries and changed his name to Koresh, the Hebrew equivalent of his given name, Cyrus. As the messiah of Koreshanity, he formed a church, started a magazine, The Flaming Cross, which continued to be published regularly into the 1940s, and founded a community on a 300-acre tract in Florida in 1894. He lived there with about 250 followers until 1908. Upon his death, his followers waited for him to rise again, as he had prophesied. After four days, health officials appeared on the scene and ordered his burial. Hollow Earth theories continued to be promoted by enthusiasts even as explorers reached the North and South Poles during the first decade of the twentieth century. The open poles theory was further undermined when aviator Richard E. Byrd (1888–1957) became the first to fly over the North Pole (1926) and the South Pole (1929) and reported nothing but unending whiteness. In 1959, a U.S. submarine journeyed beneath the polar ice cap and actually surfaced at the North Pole, based on precise calculations. Since then, year-round research stations have been built on several sites at both poles. No large holes have been found. Hollow Earth enthusiasts continue to believe. Teed's Concave Earth theory, for example, was tested during World War II (1939–1945) by a Nazi scientist. He aimed a camera at a 45-degree angle into the sky from an island in the Baltic Sea, hoping to catch an image of a British fleet on the other side of the concave Earth. The experiment was unsuccessful. Beckley, Timothy Green, ed. The Smoky God and Other Inner Earth Mysteries. New Brunwick, N.J.: Inner Light Publications, 1993. Bernard, Raymond. The Hollow Earth. Mokelumne Hill, Calif.: Health Research, 1963. Michell, John. Eccentric Lives and Peculiar Notions. San Diego, Calif.: Harcourt Brace Jovanovich, 1984.